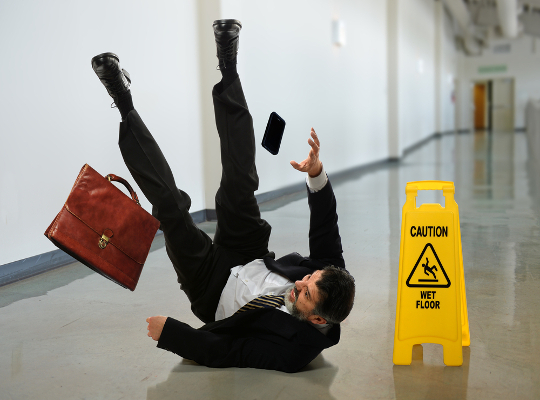 Slip-and-fall/trip-and-fall claims, also known as premises liability claims, are a very common form of personal injury claim. There is a widespread misconception among the general public about slip/trip and fall claims: that if you walk onto somebody’s property, fall down and get injured, you have a personal injury claim against the property owner. Unfortunately, it’s not that simple. Generally speaking, for liability to attach against a business or property owner, the owner must have done something wrong, something negligent that caused your injury. The form this wrong takes in a premises liability case under common law is typically that the owner failed to warn or protect an individual lawfully on the premises from a dangerous condition which they knew or should have known about. In Wisconsin, depending on the facts of a case, an easier standard, created by the Wisconsin ‘Safe Place Act’ may apply: liability under the Safe Place Act occurs where an owner fails to maintain their property in as safe a condition as the nature of the property reasonably permits. Liability is generally an issue with slip/trip and fall cases, as the insurance company can almost always find some necessary element in the facts to fight about. Documentation is extremely important, and having photographs, video and witnesses at the scene, or copies of correspondence that demonstrates prior knowledge of a dangerous condition by a business or property owner, can greatly strengthen a claimant’s position. Not all injuries result in a viable personal injury claim. An experienced personal injury attorney can give you an unbiased opinion on whether your claim is worth pursuing, and if so, how to properly document and preserve the evidence. "Mr. Smith has been excellent by ensuring my claim was handled in an efficient manor. I would recommend his services to anyone who has been injured." "I just wanted to thank you for all that you have done. I really appreciate your professionalism, expertise and kindness. I put my trust in you and you did not let me down. I would highly recommend you. I hope that I do not need a personal injury attorney again, but if I do, I would definitely choose you!" This web site is made available by Alexander J. Smith Law Offices for general information purposes only and to provide a general understanding of certain aspects of personal injury law, NOT to provide legal advice. Readers of this web site are cautioned that reading it or submitting an inquiry does not create an attorney-client relationship between the reader and Alexander J. Smith Law Offices.